This cosmetic procedure eliminates discoloration and stains on the teeth and can brighter the natural pigmentation of the teeth. The degree of improvement will depend upon how severely the teeth are stained or discolored as well as the nature of those stains. Brown or yellow due to coffee, tea, or smoking will generally lighten. Teeth that are gray due to antibiotic use will whiten slower and may require several treatments. 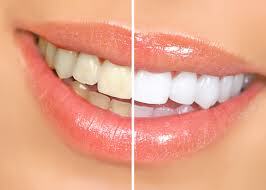 Your teeth will be noticeably brighter after teeth whitening. While there are a number of over-the-counter teeth whitening methods that make various claims, we will recommend for you the product with the most effective teeth whitening treatment. Whitening is usually accomplished at home with either custom-fit trays or pre-formed trays, In-office, or sometimes a combination of the methods is utilized. 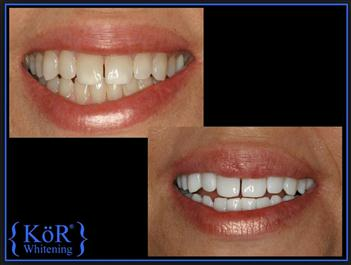 Teeth whitening techniques are best performed under supervision of a dental professional to ensure the safest results. Kor Whitening will provide you with a beautiful, healthy and natural looking white result. This product is known to restore your teeth’s ability to absorb oxygen. This product is gaining popularity for its effective use on tetracycline-stained (dark) teeth. Patients experience low to no sensitivity and the process is comfortable and easy. Opalescence is a professional whitening product designed to fit the needs of all patients. With several whitening products available, we primarily use the In-Office Boost so we can share in the excitement of brighter, whiter teeth after each treatment. This particular product is also great for patients with sensitive teeth, as the process may be closely monitored by our staff. The teeth are carefully isolated from the lips, cheeks and gums and the whitening gel is carefully applied to the teeth.